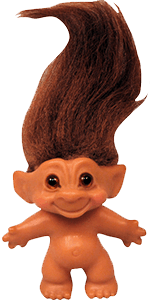 The Troll Doll was originally known as the “Dammit” doll in honor of its creator, Danish woodcutter Thomas Dam. In 1959, Dam could not afford to buy his young daughter a birthday present and instead carved for her a doll inspired by the legendary trolls which were believed to live in the Nordic forests and would bring luck to any humans who could catch them. Dam’s daughter took to the doll and dressed it up and showed it to local villagers. The doll attracted the eye of a Danish toy store owner and soon Dam was selling versions of the doll all over the world, selling more than a million of the in the United States in 1964 alone. Part of the dolls charm was that it was so ugly – it had huge ears and a pot belly, no forehead and long strands of sheep’s wool for hair. Danes believed the dolls were so ugly that you had to laugh at them and if you were laughing, nothing bad could happen to you. Soon the dolls became a source of good luck to people around the world. Initially they were favored by high school and college girls but soon grown men were carrying them around on their travels. United States First Lady Lady Bird Johnson bragged that she owned one and apparently plenty of other people did as well, as in the late 1960s Troll Dolls were the second largest selling dolls in the United States.